The Community Emergency Response Team (CERT) concept was developed and implemented by the City of Los Angeles Fire Department in 1985. They recognized that citizens would very likely be on their own during the early stages of a catastrophic disaster. Accordingly, LAFD decided that some basic training in disaster survival and rescue skills would improve the ability of citizens to survive until responders or other assistance could arrive. The Whittier Narrows earthquake in 1987 underscored the area-wide threat of a major disaster in California. Further, it confirmed the need for training civilians to meet immediate post-disaster needs. The training program that LAFD initiated proved to be so beneficial that the Federal Emergency Management Agency (FEMA) felt that the concept and the program should be made available to communities nationwide. In 1993, the Emergency Management Institute (EMI), in cooperation with LAFD, expanded the CERT materials to make them applicable to all hazards. In 2002, following the tragedy of 9/11, President Bush asked all Americans to volunteer in the service of their country. The Citizen Corps program was created to spearhead this effort to harness the power of every individual through education, training, and volunteer service to make communities safer, stronger, and better prepared to respond to the threats of terrorism, crime, public health issues, and disasters of all kinds. CERT was selected as one of the primary programs offered to the American public to meet this challenge. Wilson County CERT members are involved in a wide variety of activities throughout the year. During emergencies and disasters, CERT may be called upon to help with evacuations, search and rescue, damage assessments, traffic control, or even to count dump trucks of debris so communities have proper documentation for FEMA reimbursement! But don't think that when disasters aren't happening, CERT isn't active! Team members meet together regularly to train, learn, exercise, and provide service to the communities and agencies of Wilson County. They help with crowd control wherever large numbers of people are gathered -- whether it's for a concert, a community festival or a flu clinic. They assist the Sheriff's Department with evidence searches or with securing the perimeter of a crime scene. The first step to becoming a CERT member is to take a CERT Class. CERT training is a 20-hour class and is always free. But you don't have to be interested in joining the team to take the class. Everyone can benefit from learning to be better prepared for an emergency or disaster. Following a catastrophic event (such as a tornado or flood), you and your community may be on your own for a period of time because of the size of the area affected, lost communications and impassable roads. Knowing what to do can save lives and protect property until professional emergency services personnel are able to reach you. 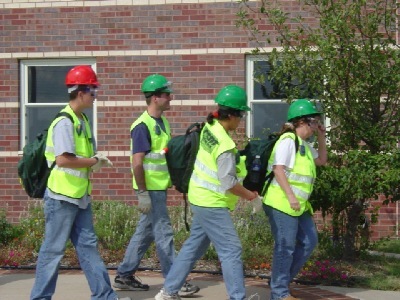 CERT training covers basic skills that are important to know in a disaster when emergency services are not available. Over the course of the 20-hour class, you will learn about disaster preparedness, basic fire safety, light search and rescue, disaster medical operations, and natural gas safety, among other topics. With proper training and practice working as a team, you will be able to do the greatest good for the greatest number of people after a disaster, while protecting yourself from becoming a victim.